SOUTH PARK CENTER has been a distinctive Los Angeles landmark since 1965 and originally designed by William Pereira as LA’s first modern high-rise, LBA Realty renovated the 32-story office class-A office building in 2009, which was led by world renowned architectural firm, Gensler & Associates. The renovation of the Class-A office campus advanced Pereira’s modernist design into the 21st century. The stunning two-story, dramatically lit, glass crown at the top of the building further distinguishes the Building as an architectural beacon and is visible from downtown Los Angeles, Staples Center, LA Live and the nearby 10 and 110 freeways. The Building’s exterior features elegant, metal paneling, lighting and landscaping. The lobby and entrance features floor-to-ceiling glass walls, elegant wood paneling, brushed stainless steel accents, sandblasted granite walls and honed terrazzo floors. The retail and dining court locations on the concourse level offer a wide range of retail services and numerous quick-serve dining options along with a well-equipped athletic club for employees and guests. LBA has created a unique landmark office property that provides stimulating environments to meet the needs of their corporate customers, employees and visitors. Located just blocks from Staples Center in downtown Los Angeles’ LA Live/South Park District, the project is already home to the University of Southern California, Transamerica, Fox Sports West, the United Way of Greater Los Angeles, Patina Restaurant Group and more. The Building comes alive with activity every working day. Corporate tenants and their visitors are just an elevator ride away from a thoughtful array of business amenities and an exciting urban marketplace of food, fitness and shopping. 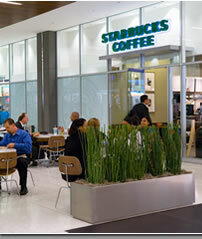 The lobby-level retail concourse features an assortment of high-quality, nationally respected brands including Starbucks, Subway, Trimana, Cilantro Fresh Mexican Grill, and FedEx Kinkos, as well as a tenant lounge and a conference room complete with flat screen TV’s and state of the art audio visual equipment. The subterranean garden level offers a very convenient dining center with food service provided by Patina Restaurant Group as well as generous indoor seating complete with flat screen TV’s and an outdoor Zen garden. The 485-seat theatre and penthouse suites are the ideal spaces for events ranging from filming to private celebrations. The Building has two (2) parking garages, parking valet service, and access to DASH service to 7th St. Metro and Union Station.